Blazing new trails in the area of reporting and transparency? Required and voluntary reporting of student data to external agencies has increased in volume, quantity, and complexity, and understanding the scope of reporting requirements and the associated burden is critical to higher education practitioners. This volume focuses on new directions in institutional reporting––and the associated burden. The convergence of increased reporting coupled with the demand to be more efficient with resources in a saturated and competitive higher education market make this a timely and needed volume for higher education administrators. This is the 166th volume of this Jossey–Bass quarterly report series. Timely and comprehensive, New Directions for Institutional Research provides planners and administrators in all types of academic institutions with guidelines in such areas as resource coordination, information analysis, program evaluation, and institutional management. This chapter explores external reporting as a tool to increase institutional transparency and suggests guiding questions for institutional consideration. 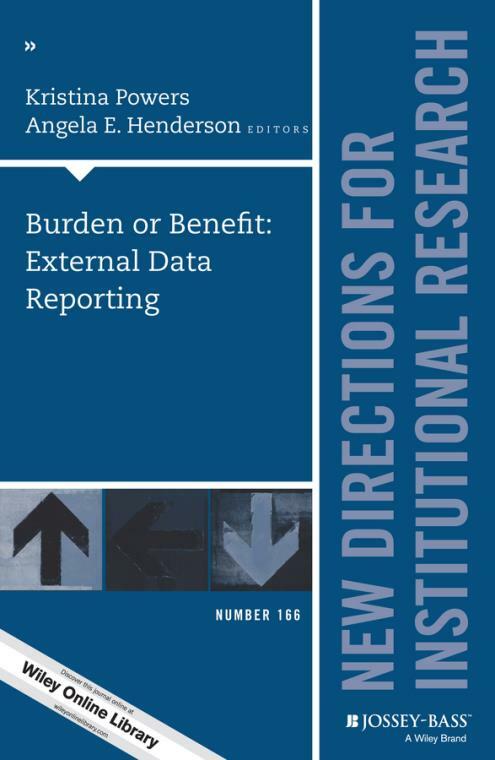 This chapter discusses the expanding demands of prominent federal and state reporting requirements and the resulting impact on institutional research. An examination of differing perspectives on the value of external reporting illustrates how perception influences the quality of data reporting. This chapter examines the necessity of developing partnerships within and outside of the institution to ensure consistent, correct, and timely data for optimal institutional decision making. This chapter provides suggestions for improving the effectiveness of external reporting while minimizing burden. This chapter discusses the benefits, limitations, and burdens of Integrated Postsecondary Education Data System data collection, alternative approaches, and possible implications of these approaches. A discussion of the benefits and costs of participation in optional external reporting is accompanied by considerations for determining if benefits justify dedication of resources. This chapter examines the impact of external reporting growth on institutional researchers and provides considerations for dealing with future reporting demands.